This train approach to dominoes is right on track. In this game that's sweeping the nation, you engineer your tiles around the electronic 3D train hub. The hub toots and chugs for a little extra entertainment, plus it holds your dominoes neatly in place. 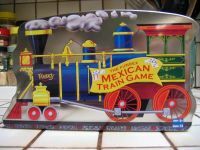 This set comes with 91 color-dot double 12 dominoes, electronic train hub (batteries included), 9 colorful train engine game pieces, game instructions, and is packaged in a colorful train-shaped tin.